Turkeys have always been an interesting study for economics. Because of the consistency of their demand in America, the price of a Thanksgiving turkey can be used as an indicator of inflation. Since 2005 the average cost of a 15-pound frozen turkey has risen from $16 to $27, a 68.7% increase. Official inflation statistics suggest the price should only have risen 19.3% to $19.09. Part of the cost increase may be due to ethanol mandates driving up corn prices. Another effect is the government’s underreporting of inflation. Turkey production is down this year, and wholesale prices are the highest yet, rising 12% to 14% over 2013. However, it is speculated that consumers of factory-farmed turkeys will not experience this increase. The average factory-farmed frozen turkey from a grocery story is sold for as little as $0.67 per pound. Specialty turkeys, in contrast, cost around $5.89 per pound. 1. Breed of the turkey. Factory-farmed turkeys are Broad-Breasted White turkeys. They were chosen because they produce the most meat in the shortest amount of time. Because of their predisposition to obesity, these turkeys have short life spans and are prone to health problems. On top of that, Broad-Breasted Whites are bred for growth so their feet often can’t support their own weight. Their large breasts get in the way of normal mating so they are artificially inseminated. Specialty turkeys are typically one of 10 specific breeds called Heritage turkeys. Raising them to comparable sizes requires more time and money, but they are considered tastier with the strongest natural turkey flavor. 2. Living conditions. Factory-farmed turkeys are bred indoors in climate-regulated cages. Discouraging the birds from moving too much keeps their meat tender, but the cramped quarters provoke fighting. Their upper beaks are clipped to avoid injuries. The factory can raise the birds year round. Some factory turkey farmers raise 300,000 turkeys a year. Turkey distributors often deliver the young chicks and then return to collect the grown birds. Distributors outsource this process to the lowest bidder. Competition in this specialized trade keeps costs low. The process of engorging turkeys has grown. Between 1965 and 2005, the weight of the average turkey increased by 4% annually and rose 57% from 18 to 28.2 pounds. The time to raise factory-farmed turkeys has also changed. From 33 weeks in 1970, the process has shortened to just 20 weeks. Cramped factory conditions cause diseases to spread quickly, so the turkeys are given a heavy diet of antibiotics in their feed. The drugs are transmitted into the final product consumed. According to the Centers for Disease Control and Prevention, the prevalence of antibiotics in factory-farmed food has contributed to the rise of antibiotic-resistant diseases. Specialty turkeys are often raised outdoors in free-range conditions. These turkeys exercise more, storing more oxygen in more muscles. Oxygenated muscles results in darker, more strongly flavored meat. Because of specialty turkeys’ spacious living environments, antibiotics are usually unnecessary. The space required for each specialty bird does increase the cost per bird though. Many of specialty turkey farmers raise other animals and food at the same time. This generalist approach means they can’t use as many money-saving strategies or benefit from an economy of scale, further increasing the cost of the turkey. 3. The feed. Turkeys in the wild forage for insects, nuts, seeds, fruit, plants, amphibians, snails and worms. Specialty turkeys enjoy this great variety of foods, and their diet is also supplemented with low-cost grain. Factory-farmed turkeys, on the other hand, are almost exclusively fed heavily subsidized corn (70%) and soybeans (30%) to bulk them up as quickly as possible. Corn receives more federal subsidies than wheat, soybeans, rice and dairy combined. These subsidies are highly discriminating and directed exclusively at agribusiness special interest groups. Eight states receive over half of these subsidies. The wealthiest 10% of farmers receive 74%. During the 2012 election, agribusiness lobbyists spent $52 million rent-seeking. Their employees contributed an additional $91 million. Both President Obama and Paul Ryan have called for reducing these subsidies. To cut costs, factory turkey farmers overemphasize these subsidized foods in the turkeys’ diets. They are essentially making the taxpayers pay for some of the cost of raising the birds. Specialty turkey farmers do not take as much advantage of these subsidies. They transfer more of the cost to consumers rather than taxpayers. 4. Consistency. Factory-farmed birds are often injected with a salt and flavor solution and then sold as so-called self-basting turkeys. Because the solution is mostly water, it merely increases the weight and thus the cost without increasing the substance. It does create a finished product that appears incredibly moist without much work. However, the apparent juiciness is a salt solution, not tastier meat juices. Specialty turkeys usually have little or no processing to enhance their flavor. They are simply gutted, plucked, chilled and packaged. They can be just as moist as a brined or injected bird as long as they are not overcooked. 5. The sale. Goods normally cost the most the month of their peak demand. Oddly enough, turkey prices are the cheapest in November, not the most expensive. Unlike fresh-cut roses around Valentine’s Day, turkeys can be slaughtered and then frozen for up to two years. The sheer volume of cheap turkeys for the holiday pulls down the average cost in November. Grocery stores can negotiate contracts in January for deliveries in November. Distributors can raise the birds throughout the year and then store hundreds of millions of pounds in anticipation of Thanksgiving deliveries. Some economists speculate that customers buying turkey outside November are buying for themselves, rather than for guests, and are more willing to pay for quality. But the primary reason that turkeys are cheaper in November is because customers have come to expect it. They use the price of a turkey as a grocery store comparison for their holiday shopping. Many grocery stores sell their turkeys as a loss leader to get people into the store to buy everything else for their Thanksgiving meal. This is why grocery stores keep the cost for promotional frozen turkeys as low as possible. Farms raising specialty turkeys don’t have associated goods and services to make up the loss. Thus if you are purchasing a specialty turkey, you are buying a completely different product. You are paying for more dark meat, fewer antibiotics and more vitamins, minerals and healthy fats. An organic antibiotic-free freshly killed Heritage turkey is a different bird entirely. The cost reflects that difference. 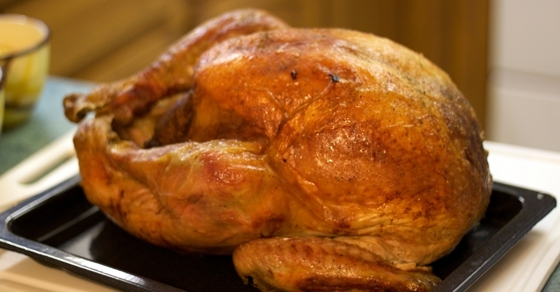 If you choose to purchase a specialty turkey, shop for quality as well as price. Factory-farmed frozen turkeys are an interchangeable commodity, but specialty turkeys vary a lot. You may want to do research on which breed of turkey you’d prefer, what diet you’d like your turkey to have had or even which farm, local or national, you want to support. If you choose to purchase a factory-farmed turkey, check grocery store ads to find the cheapest one. If the price is particularly low or if you want a turkey for another time of the year, buying multiple birds to store in your freezer may save money because they are almost 10% less expensive in November. Because factory-farmed turkeys are a loss leader, the place where the turkey is cheapest is probably not where the rest of the meal will be cheapest. If you’re willing to shop at multiple grocery stores for your meal, purchasing your turkey from one store and the rest of your ingredients from another could save you money. Regardless of which turkey you choose this Thanksgiving, taxpayer money obviously shouldn’t be a factor in price comparison. Over 70% of the calories American consume come from wheat, corn, soybeans and dairy. Nutritionists call this plant deficiency syndrome. Our federal government shouldn’t incentivize these four foods creeping into everything else. If the corn and soybean subsidies were removed from the table, it would be interesting to see the price difference between these two types of turkey.